Brento sp. z o.o. sp. k.
Imprezowicze, na koń! 👑 WOW! 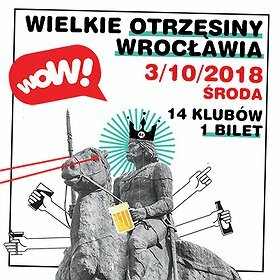 Wielkie Otrzęsiny wracają do Wrocławia! WOW! The Great Freshmen Party gives you a unique opportunity to tour around the coolest spots of the city’s nightlife. It’s one and only chance for truly spectacular integration with thousands of students of local universities. Music concerts, extraordinary DJ sets, dance shows, and really crazy parties – all this makes WOW! an obligatory entry in calendars of all party people!